Pan-Fried Cajun Chicken and Penne Pasta Tossed in a Creamy Red Pepper Sauce. What should we eat after we exercise? From what I understand, it’s a good idea to eat a combination of carbs and protein within 30 minutes after a workout to help our tired muscles recover. I’m all for doing whatever it takes to prevent sore muscles so I added this super quick pasta dish to my list of post-workout recipes. It has protein-rich chicken breast, carb-packed pasta, and a creamy sauce that makes the entire meal look, and taste, like date food! Of course, the heavy cream in the sauce won’t help develop six pack abs, but it does add body to the delectable sauce before you set this recovery pasta dish on your plate…or serve to a date! Sign-up and I’ll uber a quick and delicious recipe to your inbox every Friday. It’s FREE! In a medium bowl, toss chicken strips with Cajun seasoning, olive oil and black pepper. Set in the refrigerator to marinate. While chicken is marinating, cook pasta according to package directions. Drain and set aside. To cook chicken, heat a skillet over medium heat. Add marinated chicken strips to pan and spread them out evenly in the pan. Let cook, without stirring, for 1 minute. Turn each chicken strip over to cook the other side, without stirring, for 1 minute. Stir and continue to cook chicken strips until they are no longer pink on the inside, about 1 minute longer. Remove cooked chicken from the pan and set aside. While the skillet is still hot, add diced red pepper to pan. Cook and stir to slightly soften, about 2 minutes. Pour in broth. Combine browned bits in the pan with the broth. Reduce the broth until streaks appear in the pan when you swipe a wooden spoon through the broth (see the video above for a visual), about 4 to 5 minutes. Stir in cream. Season with salt and stir again. Add cooked chicken and pasta. Stir to coat with sauce. Top with Parmesan cheese and parsley (if using). Brent Garell (hey that’s me!) is the guy behind College Recipe Cafe. He is the author of The Cook-a-Palooza Experience and 15-Minute Money Saving Meals for Students. 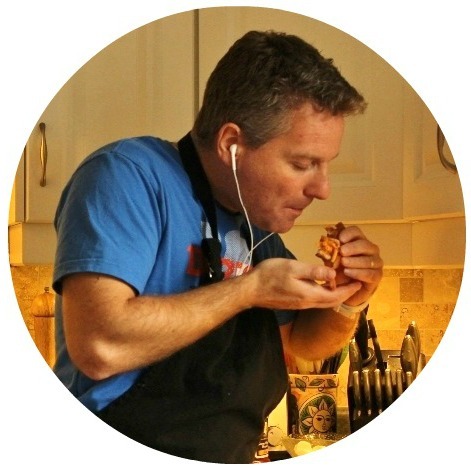 He teaches cooking classes at local colleges and online at Cooking Pro Jumpstart.